We would like to remind you that these news are for the PS3 and Xbox360 platforms since GTA V will only be released for these two platforms in the spring of 2013. A PC version may be announced later in 2013. In the background of the picture we can see the same type of houses we have seen in San Andreas which actually makes me believe that the game may have something more in common with San Andreas. We may have some action in the same neighbourhood or even meet the old version of CJ. Who knows? Let's hope the next trailer will unveil even more about the game. 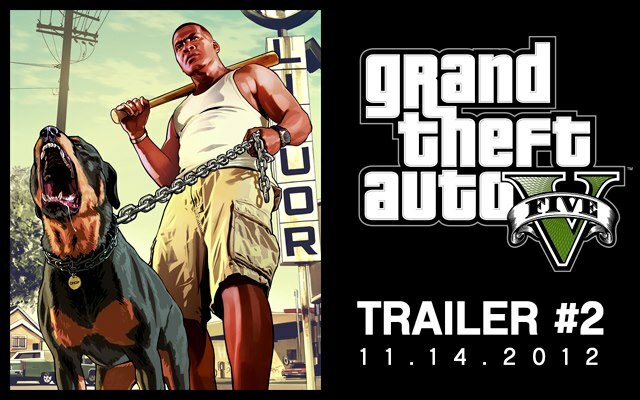 What do you expect from GTA V second trailer? Just a quick post to let you know that we've been right with the launch date for GTA V. After there were several rumors and pictures about the release date for GTA V, Rockstar has finally confirmed the release date for GTA V for somewhere in the spring of 2013! And the screen they have posted makes you think further than the period when the game will be launched ... makes you think about summer! Rockstar Games just posted a new artwork (the first official artwork actually) about GTA V and a short description: 'lots of info coming next month'. Well we already knew that there will be some big announcement in the next few weeks but now we got the official confirmation. We will probably see a release date for the game and a few new screenshots/videos, maybe even a video gameplay footage. This announcement makes us think that GTA V will be released somewhere in the spring of 2013, March or April to be more specific. It was about time if we look at the release timeline of Grand Theft Auto games. There are around four years between them but between GTA IV and GTA V there will be a difference of five years in terms of release date. This picture has been posted by a journalist who has been invited to Rockstar's headquarters in New York City to check out Grand Theft Auto V.
Rockstar Games released an article in which they responded to a few questions for their fans. The staff replied to a few questions related to Max Payne 3. A fan answered why Rockstar doesn't give more news about GTA V.
Well in my opinion they are waiting for the buzz to set up and they will be throwing a screenshot every now and then to create an even bigger buzz. This is a marketing strategy and it's very good for the preorders ... whenever they will be available. Rockstar replied to that question by saying that they really care about their fans but they don't have pretty much to say about the game since it is in the making and they do not want to give bad informations to the public. However they felt that the pressure is huge from the public so they released two exclusive screenshots. Actually they are the first screenshots for GTA V since the announcement trailer came up. So until now the official content we have on GTA V are the announcement trailer and the following screenshots. Playstation 4: How is it going Sony?